December 30, 2000 Cherokee is dreaming of a white Christmas – but wait! That’s not snow, it’s sand from Leonard’s excellent sandblasting job in the engine room. (Thanks again to Beaufort Fisheries fish factory for loaning us the sand blaster.) The engine room is not only clean but partially enclosed, as Jeff, Tom, Bill and Leonard worked hard on the bottom over the holidays and have finished replacing half of the back starboard section. 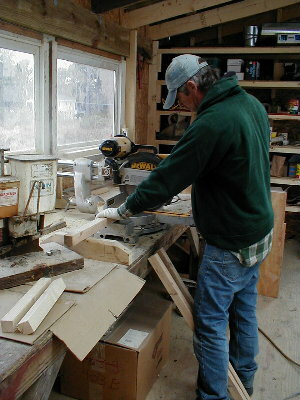 Leonard prepared the marine plywood – one layer of 3/8, one layer of 1/4, and another 3/8 layer to make a full inch of thickness. 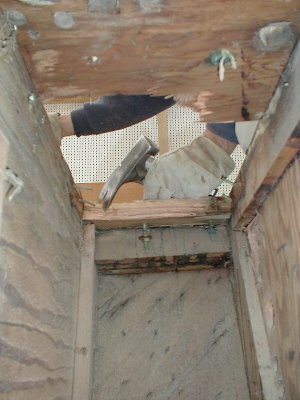 The three layers of bottom plywood match the existing three layers of mahogany. Three layers of diagonally-planked mahogany is an early Huckins characteristic, before they went to two layers after 1948. Cherokee is one of the last Huckins boats built with the three layer method. 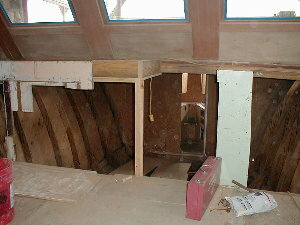 John has removed the port side deck. 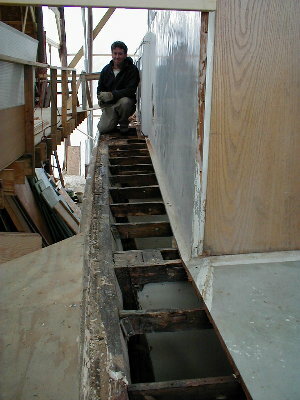 He uncovered prior patches (“patches that were poorly done,” he noted) and pockets of rot in the sheer clamp and deck beam. 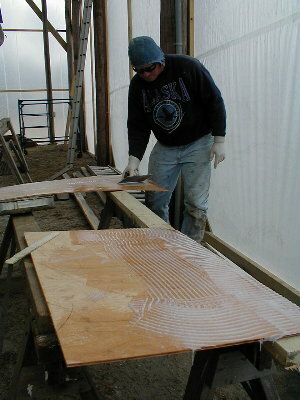 “Next we’re going to cut out the damaged areas and replace them with new lumber,” John explained. 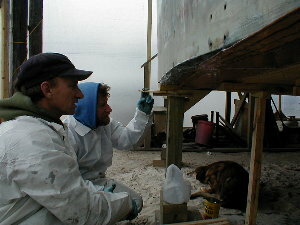 The crew removed all the forward interior mock-up walls so Robbin and Jeanette can get to the hull more easily. They will epoxy-coat the interior as soon as the temperature rises a few degrees, allowing the glue to soak in and penetrate the surface. 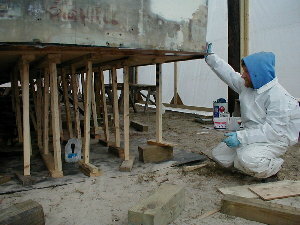 A patch of white lead-painted deck canvas was removed beneath a pilot house cabinet. This is another remnant of the past, as white lead-painted canvas was a precursor to fiberglass.